Which New Nutrition Symbol Would YOU Like to See on Food Packages? Send Your Vote to Health Canada Now! 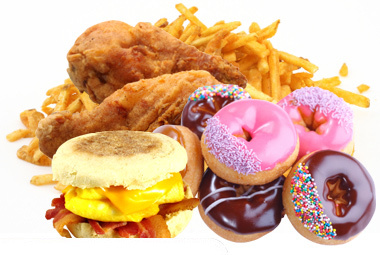 Eating too much sodium, sugars and saturated fat is linked to health problems such as obesity, high blood pressure, heart disease, stroke and type 2 diabetes. 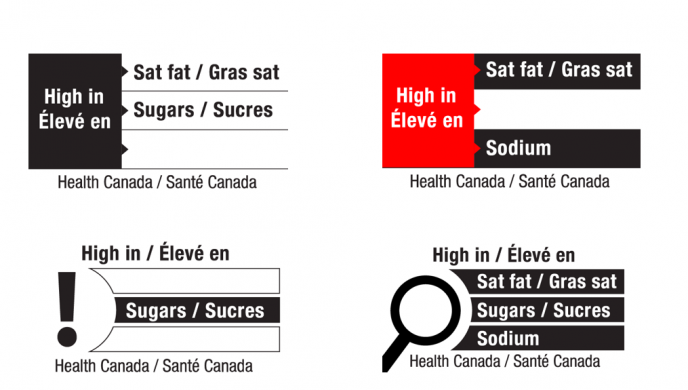 Health Canada is proposing a new nutrition symbol that would appear on the front of food packages to identify foods that are high in sodium and / or high in sugars and / or high in saturated fat. This new Front-of-Package labelling will help Canadians more quickly compare different products and make healthier choices. Under the proposed new labelling regulations, pre-packaged foods which contain 15% DV (15% Daily Value) or more for either sodium, sugars or saturated fat will need to display a special nutrition symbol. Pre-packaged meals or dinners which contain 30% DV or more for either sodium, sugars or saturated fat will also need to display the symbol. Foods such as plain milk, most vegetable oils, and fruits and vegetables without added saturated fat will all be exempt from this new labelling rule. In 2016, Chile implemented a similar front-of-package labelling program. Evaluation results found that almost all (92%) of Chilean consumers said that the label influenced their purchase in some way. And 18% of food products in Chile have been reformulated to contain less sodium, sugars or saturated fat. 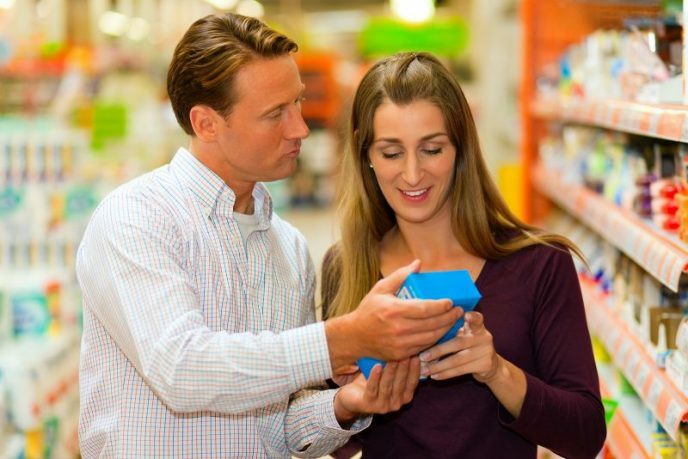 The proposed front-of-package labelling regulations may be an important catalyst for new and reformulated products here in Canada. Health Canada has proposed the following four symbol options and now wants to hear which one would be the most useful for YOU. Have your say in shaping this important national nutrition policy. Vote now by completing this short online consumer consultation here by April 26, 2018. It’s official! 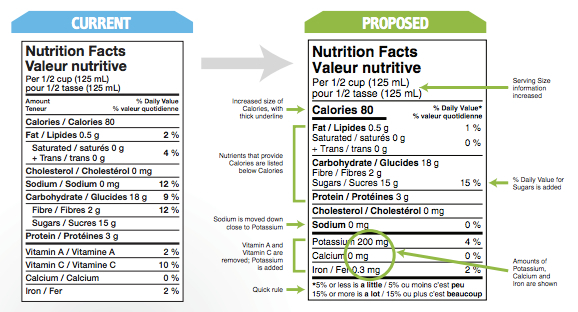 After two years of public consultations, Health Canada has finalized the changes to the Nutrition Facts table and ingredients list on packaged foods. 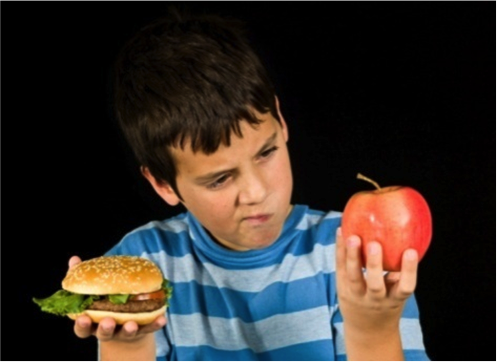 On December 14th, 2016, the Honourable Jane Philpott, Minister of Health announced that these changes are all part of the strategy to help make healthy food choices the easy choice for all Canadians. The food industry has until 5 years – until 2021 – to make these changes, but you may start seeing new labels as early as next year. Stay tuned, I’ll let you know as soon as it happens! 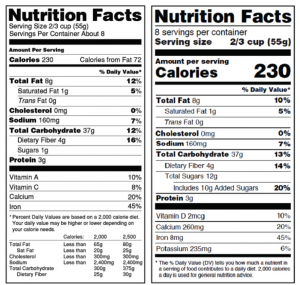 Health Canada recently announced proposed new changes to the Nutrition Facts table and ingredients lists with the goal of improving nutrition information on food labels. –	grouping nutrients that we need to get enough of (fibre, vitamins, minerals) at the bottom half of the label. The consultation period is now open, and all consumers and stakeholders are invited to provide input on the proposed changes. Please take the time to have your say and share your feedback in shaping this important nutrition labelling regulation. 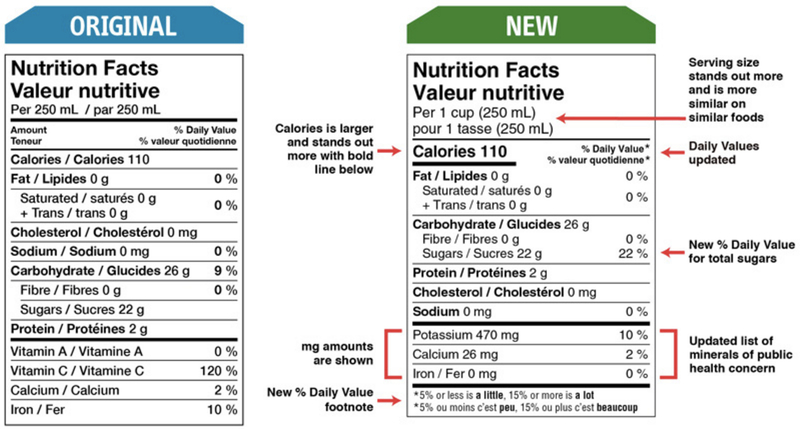 Health Canada has developed fact sheets on: Nutrition Facts table and Ingredient List, Serving Sizes and Sugar Content as well as an Executive Summary of the proposed changes. Consumers can provide their feedback through a 10 question online survey. For food and health professionals, there is also a series of five technical consultation documents which explain the rationale for the proposed changes: Format Requirements, Core Nutrients, Daily Values (%DV), Reference Amounts and Serving Sizes. You are also invited to provide feedback to each of these consultation documents. All comments must be submitted to Health Canada by September 11, 2014. Menu labelling – would you like 90 minutes of walking with that? The conversations about menu labelling continue. Dr. David McKeown, Toronto’s Chief Medical Officer of Health supports mandatory menu labelling of calories and sodium, while some researchers wonder whether “physical activity equivalent” labelling is a more effective strategy. McKeown urges the province to enact its own law, but if the province doesn’t do so by September, he plans to develop a Toronto-specific bylaw for chains with more than 15 restaurants. 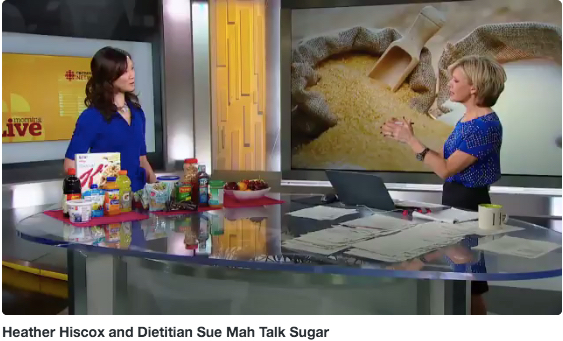 Critics say that calorie and sodium counts alone don’t allow consumers to make informed choices. A Diet Coke for example, has fewer calories than a glass of milk, while a bagel might have more sodium than a cookie. Stephanie Jones, the Ontario VP of the Canadian Restaurant and Foodservices Association endorses British Columbia’s voluntary Informed Dining program, in which participating restaurants post nutrition information in a brochure or poster, rather than on the main menu. And here’s another POV. Preliminary research shows that consumers may be more motivated to choose foods with fewer calories when restaurant menus show how much exercise is needed to burn off those calories. For example it would take 90 minutes of walking to burn off the calories in this hypothetical ham sandwich. It’s an interesting concept, indeed!